In a medium bowl, beat the sweet potatoes, 1 tablespoon butter, cinnamon and vanilla with electric mixer on low speed until blended; set aside. In a large bowl, beat the cream cheese, goat cheese and 1 cup sugar on medium speed until smooth (about 1 minute). Add the sweet potato mixture on low speed until blended (about 1 minute). Beat in eggs, one at a time. Spoon the batter into each individual crust. Bake at 350F until edges of cheesecake are set and the center is still soft and slightly jiggly (about 50 to 60 minutes). Let the cheesecakes cool, then cover and refrigerate for at least 6 hours or overnight. To finish, preheat the oven to 400F. 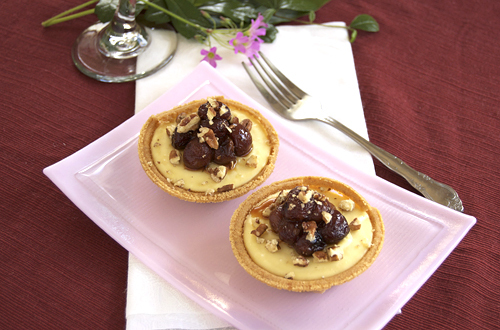 Place grapes on a baking sheet and bake until soft (about 15-20 minutes). 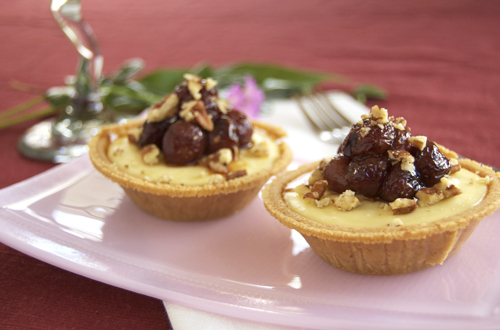 Top each cheesecake with grapes and crushed pecans, then drizzle with honey. Very creative – and if I weren’t trying to lose the 5 pounds I put on lately I’d be making these! Pretty pics too! I have already hit the print button. These look so amazingly good! The roasted grapes is a lovely touch. Sweet and savory is my absolute favorite flavor combo…I think this will be my new favorite!